Many people picture themselves getting rich in crazy ways. I used to dream of finding some undervalued stock and becoming a millionaire! I quickly found out though, that if I wanted to actually become a millionaire, I needed to start by saving in my retirement accounts. Yes, it’s the boring approach to getting rich but it’s the smarter approach since retirement accounts come with tax savings. When you become a millionaire the boring way, you’re still a millionaire. I’ve put together a list of the 7 accounts that I set up to save money, exactly what they are and how you can open them too. 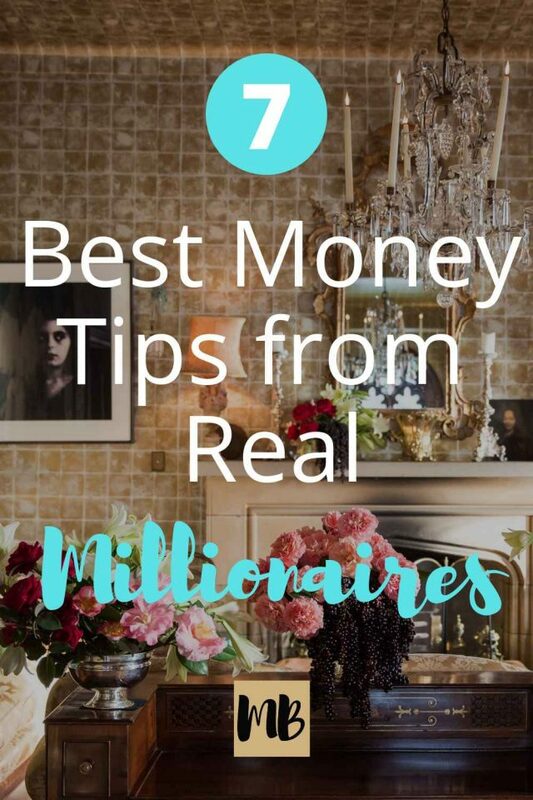 And I learned all of these tips from undercover millionaire personal finance bloggers that I’ve been reading for years. I’ll start with retirement accounts, then go into the regular taxable accounts, then end with other accounts that I’m contributing to that many people don’t know about (HSA, ESPP). It was by investing in the accounts below that I saved $26,000 in seven months. My goal is to hit $1M before I’m 30. My eyes used to glaze over when I was reading about IRAs and 401(k)s but trust me, it’s all good life stuff to know. This guy became a millionaire in 10 years by saving in these accounts. 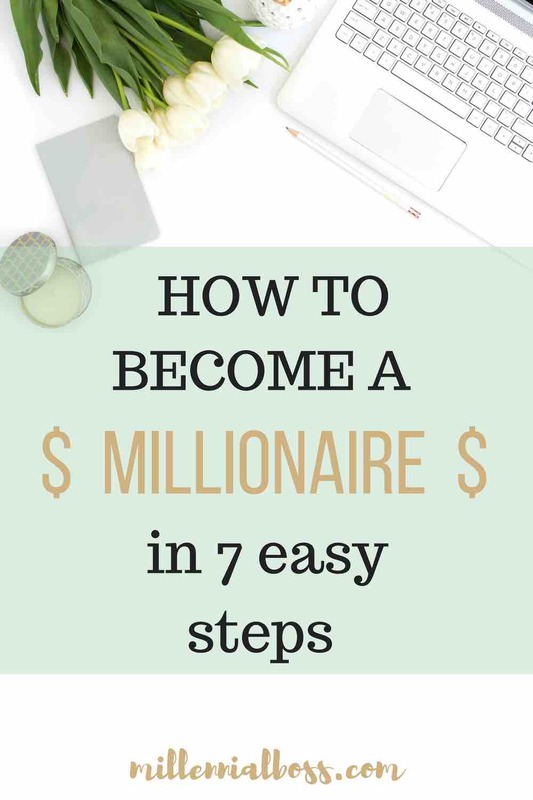 If you actually want to become a millionaire, keep reading. Do you know your net worth? I used to be afraid of adding up all of my debts, and savings, and credit cards but it’s important to know where you stand. I use the free app Personal Capital to track my net worth. 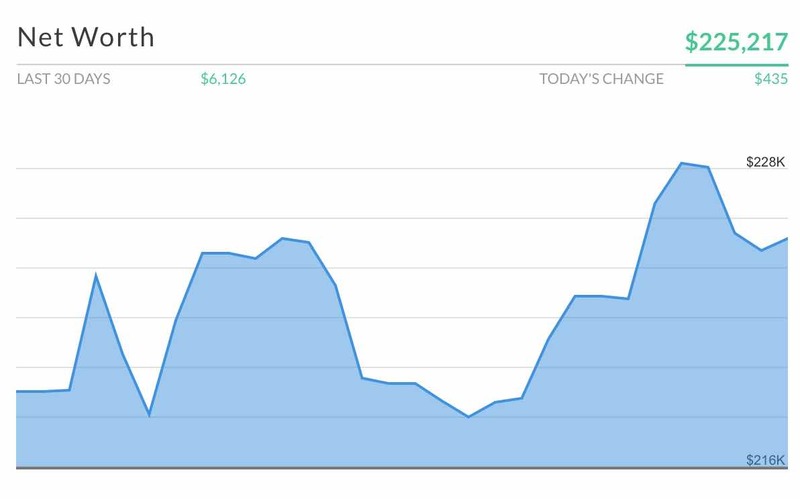 It works by aggregating all of your accounts and adding them up and giving you this pretty chart. Tracking your balance is so important and the first step to getting ahead with your money. Personal Capital tracks your spending too which is super helpful in budgeting. Sign up for a free account with Personal Capital and using this link. A 401(k) is a type of retirement plan typically offered by your employer through a financial services company. You and your employer can contribute a maximum of $55,000 per year to your 401(k). any after-tax money you wish to contribute (if your plan allows). How do I contribute to a 401(k)? You can sign up through your HR department (or you can open one yourself through a financial services company if you are self-employed). You then select how much you want to contribute per paycheck. This selection is typically made online. How much should I contribute to a 401(k)? I max out my 401(k) every year, meaning I contribute $18,500 before-tax dollars. I’m not a financial advisor, but I recommend putting as much money into your 401(k) as you can. Your $18.5k of contributions are taken directly out of your paycheck before taxes are taken out. What this means: The more money you save in your 401(k), the less taxes that come out of your paycheck. Win! Plus, that money compounds over time which means that your money will grow much faster than if you put it in a savings account. If you can’t contribute the full $18,500, at least contribute up to the employer match. If your employer is offering to match your contributions up to a certain amount, you don’t want to leave money on the table! How can I max out my 401(k)? Take $18,500 and divide by your salary. That is the % you need to contribute each paycheck to max out your 401(k) for the year. I challenge you to give that percentage a try for just ONE paycheck. See how it feels. You’ll be surprised that your paycheck is bigger than you imagine because less money is taken out for taxes. I bet you’ve splurged on big expenses before. Splurge on yourself for one paycheck. I started maxing out my 401(k) last year and this year I added an additional 10% so I could contribute after-tax dollars too. Can I contribute after-tax dollars to my 401(k)? Some plans allow you to contribute after-tax dollars to your 401(k). Only contribute after-tax dollars if you have already contributed the maximum $18,500 before-tax dollars and are also contributing to the other accounts I list below. You can make after-tax contributions directly from your paycheck too (if your plan allows them). The pre-tax and after-tax dollars are kept in two separate accounts in your 401(k) which makes the after-tax money easy to rollover into an IRA. I contribute after-tax dollars to my 401k so that I can do the mega backdoor roth strategy. This strategy is pretty advanced but check out this great article on the Mega Backdoor Roth if you’re interested. What this means: If you want to contribute more than $18k to your 401(k), you can! Can I open a 401(k) for my side business? I recently opened a solo 401(k) for my side hustles and can now invest 25% of my business profits in the 401(k). This lowers my tax liability. I also can max out my $18,500 401(k) contribution with this account if I don’t want to hit it with my 401(k) plan from my employer. IRA stands for individual retirement account. This is an account that you open on your own with the money in your bank account. I honestly had no idea what IRAs were until I started learning about personal finance. Do not fret, IRAs are just another type of account that you can open that offers you tax benefits + retirement savings. What is the difference between a Traditional IRA and Roth IRA? There are two main types – Traditional IRA and Roth IRA. You can contribute to a Traditional IRA and deduct your contributions (given you’re not over the IRS income limit). What this means: Lower your taxes at year-end! Woot woot! Or you could contribute to a Roth IRA which is an after-tax account, meaning you can’t deduct your contributions. Your money grows tax free when it’s in a Roth IRA though which is really nice. I recommend putting $5,500 in a Traditional IRA if you are still under the income limit to deduct your contributions. You can contribute up to $5,500 total per year to an IRA says the IRS. (You can technically contribute more to an IRA through the Mega Backdoor Roth strategy. For those interested, check out this post from the Mad Fientist). Opening an IRA is a no-brainer for most people and something you should consider on top of your 401(k). If you want to open an IRA, consider opening one with Vanguard or Betterment. I recommend opening an IRA with Vanguard if you don’t mind doing a bit of paperwork and want the cheapest expense ratios out there. On the other hand, I recommend opening an IRA with Betterment if you want to open the account 10 minutes from now, don’t have much money to contribute, and still want some of the cheapest expense ratios out there but not as cheap as Vanguard. Betterment has no minimum balance so you could put just $20 into a Betterment account to get going. Over time, that money will add up. If you’re interested in opening an account with Betterment, here is my link to a special offer. It sounds fancy but this is just another investment account that you set up yourself with money from your bank account. Unlike traditional IRAs, all of your contributions to a brokerage account are with money that you have already paid taxes on. You can withdraw the money and earnings much easier than IRAs and 401(k)s.
How can I open a brokerage account? I recently set up a brokerage account (AKA regular taxable account) and started contributing small amounts of money per paycheck. I recommend Betterment, which is a robo-advisor. This means that investment decisions are made for you based on an algorithm that considers your age, retirement goals, etc. The fees are low and you don’t have to know much about investments to use it. Betterment also has no minimum balance so you could put just $20 into a Betterment account to get going. Over time, that money will add up. You can also open an account with a financial services company like Vanguard or Fidelity and choose your stocks from their platform. If you’re not into robo-advisors and want to choose your own stocks, I recommend the following companies. You can also open an account with a financial services company like Vanguard or Fidelity and choose your stocks there. I personally prefer investing in index funds (such as Vanguard’s VTSAX) but if trading motivates you to save more money, than go for it. Do whatever motivates you to save more. Learn more here at firedrillpodcast.com. My co-host and I interview six figure side-hustlers, people who are crushing it in their career, early retirees who walked away from corporate life in their thirties and more! We’d love to have you subscribe to us in iTunes or your favorite podcast player. A Health Savings Account (or HSA) is another account I opened this year after reading the Mad Fientist’s post on using your HSA as a retirement account. Essentially, you choose a high deductible health plan with your employer (one of the options for your health insurance) and then open a health savings account (HSA) which is another type of investment account. The benefit of saving in an HSA is that your money goes in pre-tax, grows pre-tax, and then your money and your contributions are not taxed when you pull them out for qualified medical expenses. What this means: Tax-free growth all around. Um, pretty freaking awesome! You can maximize the growth by saving all of your medical receipts for years and letting compound interest do its thing. Someday when you want the money, you can appear with all of your receipts (digitized of course) and take out the money tax free. You can then use the money on whatever you want or need in retirement! You can contribute $3,450 per year for singles and $6,900 for married couples and families. I contribute the maximum each year to my HSA. You probably already have a savings account. What you may not have is a high interest savings account. A high interest savings account is just a savings account that pays you a higher interest rate. I have an Ally savings account and it gets me 1.75% return in interest on my money. Many people use their high interest savings account as an emergency fund and that is what I plan to do. I’m currently depositing all income from my side hustles into my online savings account. Your employer may allow you to put a certain percentage of your paycheck towards an Employee Stock Purchase Plan (or ESPP). Typically, you can purchase your employer’s stock at a discount with all of the money you have contributed on one of two dates in a six month time frame. You then purchase on whatever day the price is lower and thus more favorable to you. Every employer has a different plan but typically it’s the first and last day of the six month time frame. What this means: It’s free money. Woohoo! It’s a sweet deal because not only are you getting your employer’s stock at a discount (so if it’s discounted 15% you make 15% automatically that day) but you may also get the lower price between the two days (meaning if the stock was super low the opening day and went way up on the last day, you’ll make a much greater than 15% return). These plans are typically advantageous ONLY if you sell your stock the first day you are able to. You may be tempted to chance it and hold on to your stock longer but you don’t know what will happen in the market. I’m not an investment advisor but I plan to sell as soon as my stock vests. And now to the kicker. None of this information matters if you have no money to save. Aim to save at least 50% of your income. The financial wizards recommend it. Here are the 5 top ways I’m increasing my income and cutting costs to save more money. I sold my car which cut my car payment from $380/month to zero. I took a higher paying job and negotiated my salary. I paid off my debt. I stopped buying stuff I didn’t need and sold $4,500 worth of stuff on Craigslist. I use a TV antenna from Amazon instead of paying for cable. Saving money isn’t easy but it feels pretty good to see your net worth go up. I use Personal Capital’s free net worth tool to track my net worth. Where do you invest? Do you think it’s boring to become a millionaire this way? 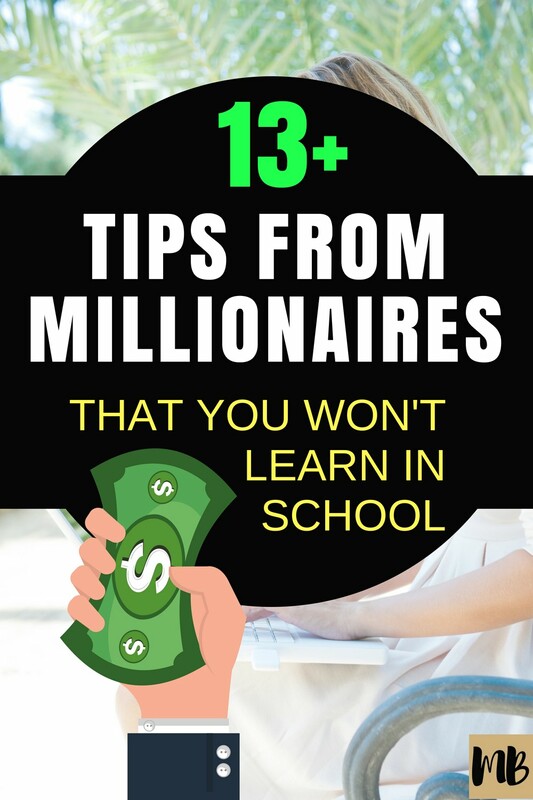 These are great tips Julie and the best part is, if you follow them, then becoming a millionaire is guaranteed (almost)! And, if I were to prioritize them, I would focus on the pre-tax accounts first, like the 401k’s and IRA’s – Good stuff! Thanks, Jon! Totally agree max out the tax advantaged accounts first. Awesome overview Julie! One thing I would caution is regarding contributing to a deductible IRA if you anticipate making a high income in the future. Our household has purposely avoided doing that because we’ll be making far too much money in the coming years and want to keep the ability to do a backdoor Roth open without dealing with the pro-rata rule. It might be something some folks who are doctors, dentists, etc, might want to consider. When they’re in residency, they’ll be able to contribute to a deductible IRA most likely, but that could really complicate backdoor Roth’s later. Can’t you roll the Traditional IRA contributions into your 401k from your employer at any point to keep the backdoor Roth path open? I’ve researched this a little but but curious to learn more. Hmm…that’s a good point and one I hadn’t thought of. Never even thought about the traditional IRA to 401(k) rollover. To be honest, I didn’t even know that was an option. The only thing I could see tripping this off is if the 401(k) plan documents don’t allow that type of rollover. But I haven’t done any research to know how common this type of rollover is. Would love to hear someone chime in about this option or if they’ve ever done it themselves. If this is something that’s simple to do, then I wonder why the pro-rata rule is a worry for anyone. Couldn’t you just roll everything over to a 401(k) right before you do a backdoor Roth? Yeah, I’d like to hear from someone who has done it too. I think 401(k) plans love to get more money so I can’t see them banning rollovers. You can definitely do a back door Roth IRA but the key is not having any money in the traditional IRA. Otherwise it starts to get super messy in terms of taxes. So ideally you contribute to your nondeductible ira and then the next day you roll it into your roth IRA. I will say that congress is looking at this loop hole and trying to close it but I have friends that are exploiting it. Mustard Seed Money recently posted…Work for Two Million Dollars or Retire Early? Yep, sure you can. It’s called a reverse rollover. You move everything in your traditional IRA over to a 401(k). It’s news to me that you can transfer a traditional IRA contribution in to a 401(k). I know that can transfer a ROLLOVER IRA (aka contributions that were previously inside of a 401(k)) into a new 401k. There’s a lot more regulations (and better bankruptcy protections in several states) with workplace investments. Great tips! I only knew about HSAs as a result of reading personal finance blogs such as yours and I’m so thankful that I did. Triple tax advantaged account, how can I say no!? That’s a bold goal that you’re making public (amassing $1M before 30 years old) and can’t wait until you get there so that I can congratulate you 🙂 happy saving! 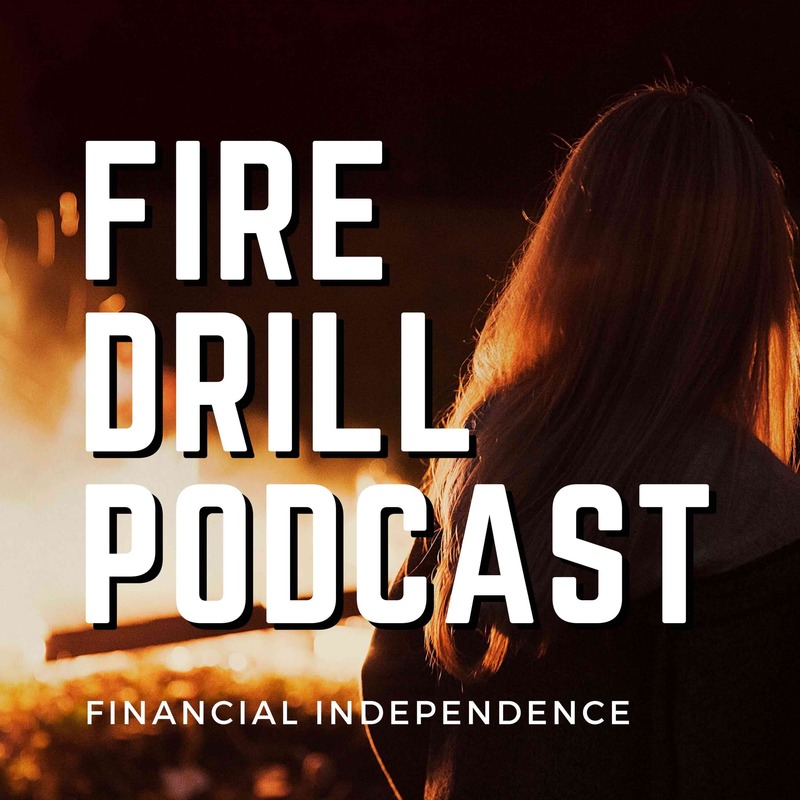 My wife and I got together with a friend who is doing some really big things and she’s been maxing out her Self-directed IRA since she was 18 (so about 10 years). You are able to buy real estate with it and wow my eyes were opened to what a huge opportunity it is for people who are willing to spend some time understanding how the tax code favors self-directed IRAs. I’m all about tax hacks so definitely appreciated this post. So glad you mentioned that! I actually stumbled upon an article earlier today about self-directed IRAs and think that might be a good option for my fiance and I. We want to get into real estate next year. So glad to hear that it has worked for someone! Awesome job on creating such great financial habits while you’re so young! I convinced my wife to ditch cable years ago so we have an antenna too. It took me until this year to decide to max out my 401k contribution. Previously, I prioritized saving after tax dollars to invest into real estate, which is part of my retirement plan, but one that won’t penalize me for collecting income before retirement age. I’m thinking about getting involved in some out of state RE too! I just forwarded your latest newsletter to my fiancé actually. Thanks for stopping by! “I bet you’ve splurged on big expenses before. Splurge on yourself for one paycheck.” One of the keenest bits of wisdom I’ve heard in a while. Awesome post, Julie. I’m sending a link to my financially-challenged nephew now. These are fantastic tips. Nothing wrong with becoming a millionaire the “boring” way! 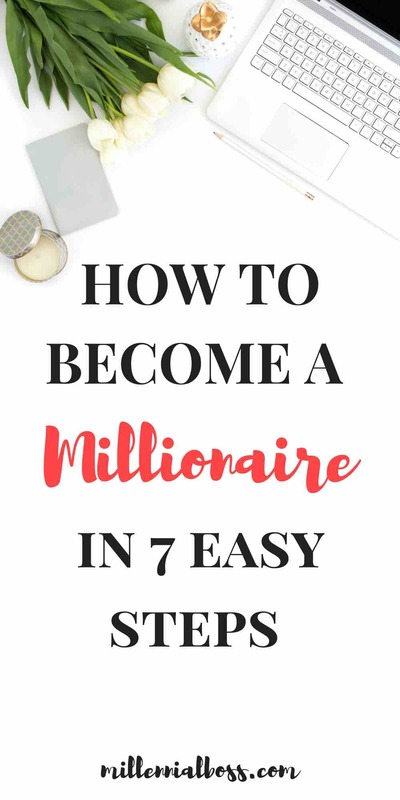 Being a millionaire through these methods will probably be “boring” since it takes time and there’s no special story behind it. But a millionaire is still millionaire. I’ll definitely take this route any day! A millionaire is still a millionaire! Yup! Awesome guide here! I put together a very similar series of steps through the past couple of months of research. However the HSA strategy always threw me off but your explanation of saving all your receipts and then claiming that money later down the line helped clear things up. Now i’m wishing I would have changed my plan when we were allowed to back in november. The ESPP idea is new to me as well, do you have any other articles on that? I need to research this a bit. Re: Step 5, let’s not forget about tax consequences of selling too early. I find it more beneficial to wait until gains will be taxed as LT capital gains vs being taxed as wages in the short period. Other than that, I agree 100%. Thanks! Reading this in 2018. Relatively new to the blog, but I love the advice and will be looking to follow much of it. I max out my Roth 401k and Roth IRA but I still have student loan debt, which I’m hoping to get rid of by October. I just started tracking my net worth, which is positive, but no where it should be given my age. Thanks for the information. 1) I am maxing out 401k Roth. 2) Next step is to open a Roth IRA and max that out as well. 3) With the remaining money, I was considering opening a vanguard account and invest in S and P 500 index funds. That should leave me with just enough to live on. What do you think of step 3? Should I go with it or anything else in the steps the author lists? PS I got no debt. Good advice, but I prefer having a Roth-IRA and Roth 401(k) or Roth 403(b) (depending on employment type) to traditional. The way I see it, taxes are as low as they’ll ever be, and the Roth means I don’t have to worry if taxes spike when I retire (which they almost certainly will, since we’re at historic lows), and if I plan on retiring a millionaire, my tax bracket is definitely lower now than then, to boot. I really hope to become a millionaire sooner than later. Each year I max out my 401(k) and Roth IRA. This should expedite reaching my goal and is great advice for anyone. Invest in yourself first! Underutilized Tip: After contributing enough to a 401k to get the full employer match, MAX OUT contributions to a Health Savings Account before doing anything else. Many of my coworkers contribute nothing to HSAs while maxing out their 401ks. Most have no idea that money in HSAs can be withdrawn for non medical expenses and taxed as ordinary income, just like traditional 401ks. But, as the article mentions, the money withdrawn from HSAs for medical expenses is not taxed at all. It’s an incredible tax break. Regarding the ESPP and the discounted purchase price (15%), your gain is actually 17.6% rather than just the 15%. You’re able to buy at 85% of the current value so 85/100=17.6% gain. This is such an awesome and helpful post. I had NO idea I could open a solo 401(k) for my business. This is the best news! Can’t wait to learn more – thank you! These are really great tips but one has to follow them religiously. Is there anybody who has performed all these tasks earlier!